English » About Us » Help » Using "Listen"
ReadSpeaker allows the text on the website to be read out loud to you. It provides you assistance if you have trouble reading text online. By having the text read out loud to you, you can understand the information on the website more easily. This makes the content more accessible and the website more pleasant to visit. As a user you don’t have to download anything. 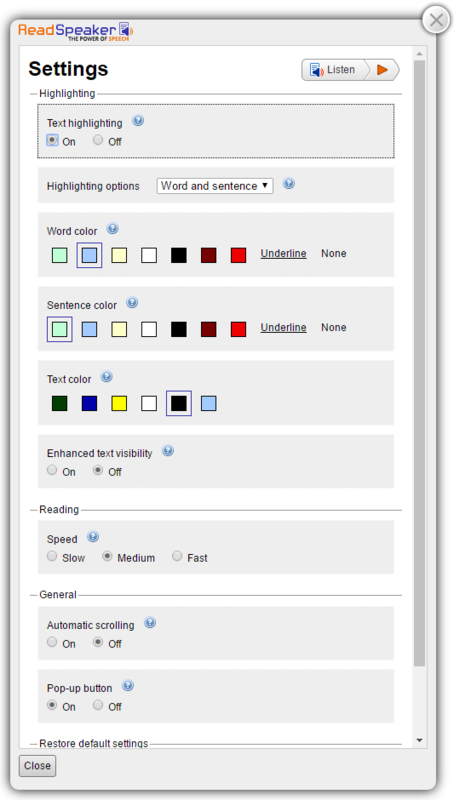 A control panel will appear (see image below) and ReadSpeaker automatically starts reading the text of the webpage out loud. You can select a part of the text that you want to listen to and then press the pop-up Listen button that appears next to the mouse pointer. When you click the pop-up Listen button, a control panel will appear (see the image below) and ReadSpeaker will automatically start reading the text you have selected. Since the control panel is built in html, you can use tab/shift+tab to navigate in the control panel and press enter to activate a certain button or link. Please visit ReadSpeaker's website for more information about online text to speech. Please tell us why you did not find this helpful. It does not answer my question. It is out of date. It is too much to read. I do not like the answer. How could we make it more helpful? You may be able to get free legal help from your local legal aid program. Or email a question about your own legal problem to a lawyer. Talk to a law librarian now!